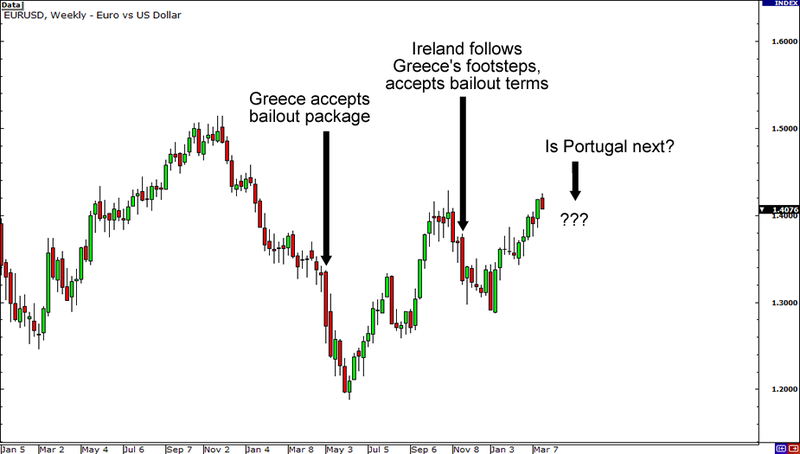 Is Portugal Next in Line for a Bailout? It’s hard to play nice on the political playground. Just ask former Prime Minister José Socrates who walked out of his post yesterday after parliament rejected his proposed austerity measures. You see, Mr. Socrates was running a minority administration, which meant that he needed the votes of opposition to get legislation passed. He had already warned that he would resign if the opposition wouldn’t approve the budget cuts, so when the plan wasn’t approved, he kept his pinky promise and walked out of parliament. He said he didn’t feel like the government had the ability to run the country anymore. Just how badly does Portugal need that budget deficit reduction plan anyway? Portugal is aiming to trim its bulging deficit from 7% of its GDP to just 4.6% this year. It’d require a lot of belt-tightening measures if they’re hoping to reach that target in the remaining nine months! Socrates and his men thought that this mission was possible with fiscal tightening policies involving new pension taxes and lesser spending on public health care. This should’ve given them a fighting chance against a bailout if these measures could put a cap on their government deficit, which widened to 11.8 billion EUR last year. But since the deficit reduction plan failed to garner enough support from majority of the parliament members, economic watchdogs are growing even more concerned about Portugal’s ability to pay back its debt. Moody’s already downgraded their credit rating and S&P could follow suit. Plus, it doesn’t help that the recent government bond sale turned out to be a dud. Now that parliament has rejected Socrates’ austerity plans, Portugal may have no choice but to ask for a bailout. As much as it would hurt the country’s pride, image, and reputation, it may be the only way to reign in its growing debt. Here’s where it gets complicated. With Portugal’s political situation in limbo (no, not like in Inception! ), it may take even more time for the country to sort everything out if it eventually does decide to accept a bailout. According to its laws, should the current government collapse, Portugal will have to wait another 55 days after the dissolution of parliament before it can hold elections. So in the event the current government does fall, a caretaker government may actually have to negotiate bailout terms with the European Union. What’s next for Portugal and the euro? Socrates swears his government has been doing all it can to keep his country from falling into the same rut as Greece and Ireland, but chances are, Portugal won’t fare any better. Borrowing costs on Portuguese debt are already at levels similar to that of Greece’s and Ireland’s, so the same fate may just be waiting around the corner for Portugal. I’m sure you’re wondering what’ll happen to the euro if Portugal decides to accept a bailout. Well if history repeats itself, as it tends to do, expect the euro to react the same way it did when Greece and Ireland got bailed out… In other words, get ready to short the euro, baby!